Ladies and gentleman, meet your new favorite single-skillet supper. Ladies and gentleman, meet your new favorite single-skillet supper. 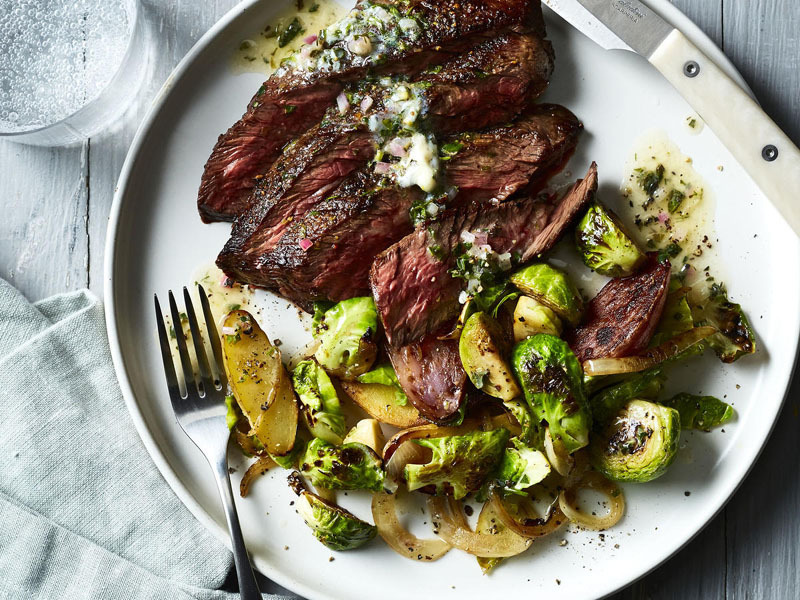 When done right, a pan-seared hanger steak is one of the most delicious cuts of beef you’ll ever eat; it’s incredibly flavorful, tender, juicy, and best of all, relatively inexpensive. If it’s a new cut to you, trust us, it’s definitely one worth exploring. Perfectly pan searing a steak is one of those essential kitchen skills that every home cook should master (don’t worry, it’s easy) in order to whip up an impressive, company-worth meal at the last minute or simply to treat yourself and/or your family to a special meal—any night of the week. And a simple-to-make compound butter dresses hanger steak up to appear far more sophisticated than its price tag might suggest. In fact, keeping a compound butter like this versatile Lemon-Herb variation on hand is an easy and awesome way to dress up any number otherwise average meals throughout the week. This recipe will leave you with plenty leftover, simply wrap it up and pop it in the freezer for later use. One final note on the compound better: Don’t fear the anchovy. Anchovy paste (if you’d prefer, you can also use a couple of oil-packed anchovy fillets, mashed well with a fork, in place of the paste) will not infuse the butter with a fishy flavor; rather, it will provide an added element of richly subtle savoriness. Of course, you can always leave the anchovy out… but we’d highly encourage giving it a try. Using the tasty drippings left in your pan to sauté a quick veggie side dish is another delicious pro move that makes this one-pan meal perfect for even a hectic weeknight. A mix of Brussels sprouts, potatoes, and onions makes for a comforting side dish that balances out the richness of the meat and butter. Any leftover steak can (and should) be used to make an epic next-day steak sandwich or salad. Make this dish once, and we can almost guarantee that butter-basted seared steak + a quick, same-skillet veggie sauté will become a dinner game plan you’ll come back to again and again. Prepare the Lemon-Herb Butter: place softened butter in the bowl of a stand mixer fitted with a paddle attachment. Beat butter on medium speed until fluffy, about 2 minutes. Add herbs, shallot, lemon zest, lemon juice, anchovy paste, salt, and pepper; beat until all ingredients are blended and smooth. Wrap Lemon-Herb Butter in a piece of plastic wrap; shape into a log (7 to 8 inches long). Chill log until firm, about 20 minutes. Prepare the Steak with Brussels Sprouts and Potatoes: Place halved potatoes and water in a microwavable bowl, and cover with plastic wrap. Microwave on HIGH until potatoes are slightly tender, 4 to 5 minutes. Transfer potatoes to a plate, and discard water. Pat potatoes dry with paper towels. Set aside. Heat a 10- to 12-inch cast-iron skillet over high. Sprinkle steak on both sides with pepper and 1 1/2 teaspoons of the salt, pressing gently into steak to adhere. Heat olive oil in preheated skillet; add steak to hot oil, and cook undisturbed for 3 minutes. Turn, and cook on other side undisturbed, 3 to 4 minutes, adding butter to skillet, and spooning melted butter over steak while it cooks last 2 minutes, until a thermometer inserted in thickest portion reaches 122°F, for medium-rare. Transfer to a plate, and drizzle with lemon juice; tent with aluminum foil to keep warm. Allow steak to rest 10 minutes before slicing. Without wiping skillet clean, add potatoes to skillet over medium-high, and cook, stirring occasionally, until potatoes are starting to brown, about 4 minutes. Add Brussels sprouts, onion, and remaining 1/2 teaspoon salt; cook, stirring often, until Brussels sprouts are tender, onions are lightly browned, and potatoes are deeply browned, about 6 minutes. Slice steak against the grain. Divide potato mixture and steak among plates. Add a pat of Lemon-Herb Butter to each, allowing butter to melt onto steak and vegetables. Serve immediately.